CLINICAL AND NEUROIMAGING STUDIES IN PATIENTS WITH ACUTE SPONTANEOUS INTRACEREBRAL HEMORRHAGE. Мaya P. Danovska1 , Margarita L. Alexandrova2, Nachko I. Totsev3, Irena I. Gencheva4, Plamen G. Stoev1. 4) Medical Diagnostic Clinical Laboratory, University Hospital – Pleven, Bulgaria. Objective: To define the prognostic value of clinical and neuroimaging parameters on the 30-th day mortality and clinical outcome after spontaneous intracerebral hemorrhage (sICH). Materials and methods: we examined 88 patients with sICH admitted to Neurology Clinic, UMHAT Pleven within 48 hours after clinical symptoms onset. Glasgow Coma Scale (GCS) score was used to assess the primary stroke severity; neurological deficit on admission was assessed by National Institute of Health Stroke Scale (NIHSS); clinical outcome at discharge was evaluated by modified Rankin Scale (mRS) and by Glasgow Outcome Scale (GOS) on the 30-th day after sICH onset. Hematoma volume was measured by the formula of Kothari: AxBxC/2 in ml. The statistical analysis was performed by SPSS 19.0 and Statgraphics plus 4.1 for Windows. Results: Initial assessment of primary stroke severity and neurological deficit by GCS и NIHSS, hematoma localization and volume were found strongly correlated with the clinical outcome on the 30-th day after the sICH onset. Age and vascular risk factors did not correlate with the clinical outcome. Male patients had better survival on the 30-th day compared with the female ones. Discussion: Neurological deficit on admission, hematoma localization and volume were found reliable predictors of the 30-th day clinical outcome that could serve for early stratification of patients and optimal choice of therapeutic approach. Danovska MP, Alexandrova ML, Totsev NI, Gencheva II, Stoev PG. Clinical and Neuroimaging Studies in Patients with Acute Spontaneous Intracerebral Hemorrhage. J of IMAB. 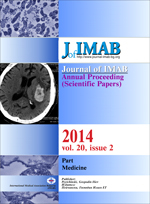 2014 Jan-Jun;20(2):489-494. doi: 10.5272/jimab.2014202.489. 5. Titianova E, Velcheva I, Stamenov B. Treatment of Acute Ischemic Stroke with Thrombolysis in Bulgaria. Neurosonology and Cerebral Hemodynamics. 2010; 6(1):9-14. 16. Li F, Chen H, Wang Y, Yang Y, Li C, Dong Z, et al. A new prognostic model and score to predict short-term outcome after intracerebral hemorrhage. Scientific Research and Assays. 2011 May 18;6(10): 2063-2068.